Best-Rated Professional (Pro) Camcorders (2018-2019) – This is a roundup of the best-rated professional camcorders. Professional (Pro) camcorders are larger than consumer camcorders, have larger imagers, superior image processors, and larger brighter lenses. They provide superior video which is a favorite of indy and professional videographers. 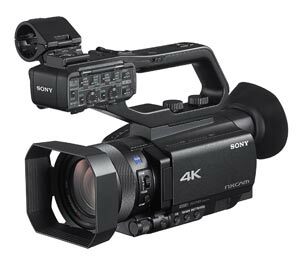 Professional camcorders also have advanced features such as 24p, time code, and XLR Audio inputs that professionals demand. Some of these camcorders have been used in films seen on the big screen, or used for documentaries. 4K Ultra HD Pro Camcorders are starting be much more popular and dominate the marketplace. Broadcasters will want camcorders with 3G, HD-SDI outputs. These top professional camcorders below are ones that have met Smart-Review’s ratings for best camcorders. See our glossary of terms at the bottom of the page. Recording Bitrate in Mbps = Camcorders compress video to fit on memory cards or internal memory. The higher the bitrate, the better the quality of the video, as it is less compressed and has fewer artifacts caused by this compression. Built-in WiFi & NFC = Modern camcorders have wireless WiFi and NFC built into them. This provides wireless control of your camcorder from a tablet or smartphone, and an ability to transfer video wirelessly. Almost all camcorders today have built-in WiFi. 3G SDI, HD SDI Outputs = These are specialized outputs, mainly used by broadcasters to transmit their video. HD-SDI transmits up to 720p or 1080i, while 3G SDI transmits up to 1080p Full HD. SDI can send an uncompressed signal to a transmission station or a broadcast truck. XLR Terminals = Only on professional camcorders, XLR Terminals are used primarily as a balanced audio connector for high quality microphones. Time Code = Using a Time Code allows for synchronization of audio and video. Very useful for editing. LANC Terminal = This allows Tripods which have a control handle, to connect to the LANC Terminal (through a cable) and allow you to control the camera from the controller on the Tripod. Imager = This refers to the Imager of the camcorder, where the light hits from the lens. This is like the retina of the eye. The larger the imager, the better the quality of the video and better low light performance. High end pro camcorders generally have a larger imager. Larger is better. A 1/2.6-inch imager is double the size of a 1/5.2-inch imager. Dual Card Record = This means that the camcorder can simultaneous record to two memory cards at the same time. Thereby making a perfect backup, should one memory card fail during recording. Uncompressed Out = This type of camcorder can also record video to an external recorder “uncompressed” for maximum quality. IEEE 1394 = This refers to firewire, which is a connector like USB 2.0 to give a fast connection from your pro camcorder to your computer to transfer video.